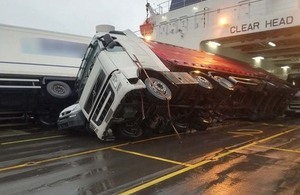 Urgent bulletin on remaining in vehicle cabs while ferries are at sea, issued after a shift and toppling of freight vehicles during heavy weather. The MAIB has today issued a safety bulletin after the shift and toppling of freight vehicles on board ro-ro passenger ferry European Causeway during heavy weather while on passage from Larne, Northern Ireland to Cairnryan, Scotland on 18 December 2018. The bulletin contains details on the background of the incident, initial findings, safety lessons and recommendation, read more. A full report will be published when the investigation is complete.